The covers of the English language Lazarus War books are amazing, and I really couldn’t be happier with the choice of artist and design direction that Orbit has taken, but it’s also really interesting to see how other artists interpret the universe. 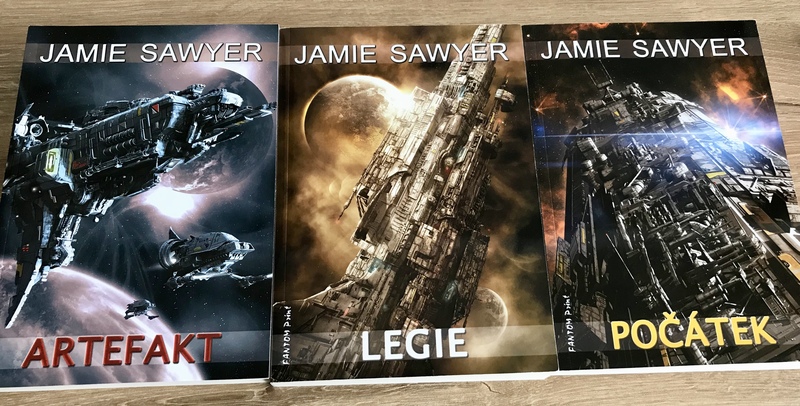 Orbit is great with engaging with me, and one of my favourite aspects of the publishing process is discussing the covers and how the technology of this universe should look. There’s a real sense of ideas coming to life in that process. However, the foreign language editions are created without any input from me. I’m sure that many authors would find that quite daunting – writers do tend to want to control every aspect of the process! – but it’s also very liberating. These editions are someone else’s view of my books, which I find really intriguing. Here are the Czech language versions – known as Artefakt, Legie and Pocatek. I love this gritty, dark art style. The ships look genuinely imposing; with a real sense of scale. Fantom Print certainly did a great job of the design of these books. 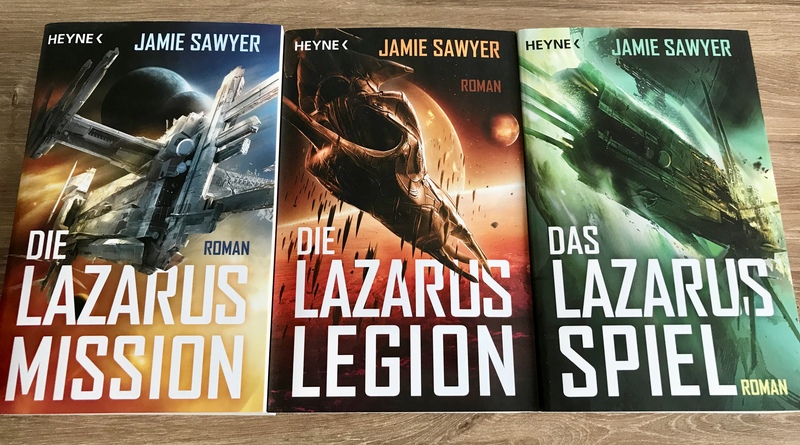 Next up, here are the German versions – known as Die Lazarus-Mission, Die Lazarus-Legion and Das Lazarus-Spiel, published by Heyne. I love that Lazarus War: Origins is known as The Lazarus Game in Germany! These covers are most similar to the English and US editions, but they have their own style. The actual books, in hand, are physically also quite different. They remind me of James SA Corey’s The Expanse, also published by Orbit. 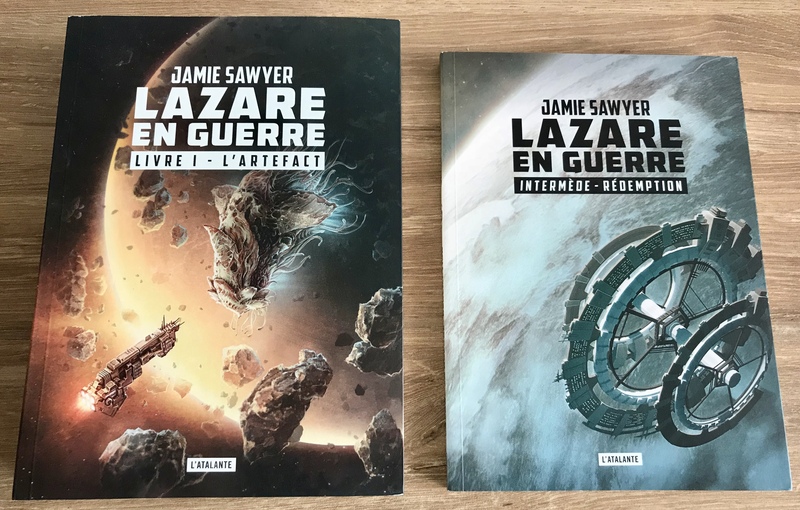 Finally, there are the French language versions – known as Lazare en Guerre: L’Artefact, La Legion and Origines, published by L’Atalante. I don’t actually have the last two, so I can’t share those, but the covers generally have a really European comic style. They are fantastic pieces of art in themselves; reminding me of Moebius and late ‘70s retro SF. The other great thing about the French editions is that they include a physical release of Redemption, which is published as book 2.5. This is the only market in which this novella is physically available – in the US and UK, it’s on ebook and audiobook, but paperback. The physical books are also great quality. For everyone following The Eternity War, the French translation is in the works, and book one – Pariah – will be released soon. I’m not sure whether the name will remain the same in France, but I can’t wait to see what the artist will do with that book! Don’t forget that The Eternity War: Exodus is released in November 2018. You can pre-order your copy here.